You can make sundal in many different forms. You can use any type of bean to make sundal. However, the first thing that strikes our mind when we hear sundal is chickpea sundal. It is called Konda kadalai sundal in Tamil. This is a famous recipe which is done during the Vinyagar chaturthi festival. Chickpea sundal along with Kozhukattai is the combo for this festival. It is believed that Lord Ganesha loves these recipes. Who will not love? leave alone the belief, every kid loves sundal and kozhukati for its taste. Not only taste this chickpea sundal is high in protein which is undoubtedly healthy. 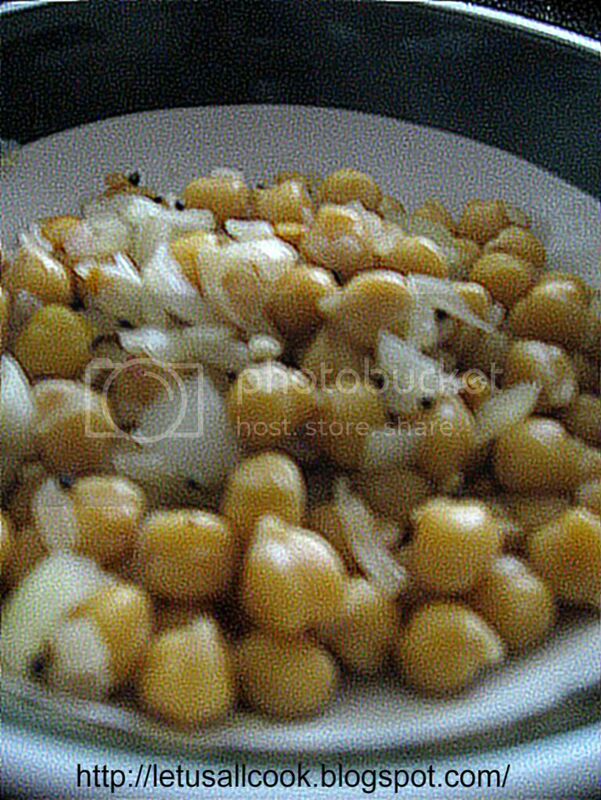 Pressure cook the soaked chickpea with required salt for 3 hisses. In a pan, add oil, mustard seeds and when the seeds pops, add hing. Add the urad and channa dal and saute. Now add the onions and fry then till they are light brown. Add the green chillies, curry leaves and little salt. Now add the cooked chickpea and mix them well. Now add the shredded coconut and mix well. Serve hot! This is a very easy snack and no wonder Lord Ganesha loves this recipe. Note: You can make this chickpea sundal without onions and coconuts too. Sundal looks so good. My mom makes sundal every Thuresday for Guru. Thanks. SUndal looks delicious...the idea of adding onions sounds good..
Sundal looks great, very nice recipe!! !